So I was playing a game and attempted to create a savestate using a hotkey, F5. However, it didn't work, neither did the hotkey for loading savestates, F7. I checked the existence of the state, and sure enough, it's there. I dropped into the Hotkey config and tried to switch the key responsible for making saves, but for some reason, the config didn't let me. It stayed as `F5` and didn't switch to "..." so I could swap it. (12-27-2018, 11:33 PM)Admentus Wrote: Anyway, Dolphin is still having issues with hotkeys, I made an issue on it on the bug tracker some time ago, but it isn't really accurate anymore. With some further testing, the issue specifically only occurs if the line "PadProfile1" is added in a game's ini config, which refers to the first GameCube Controller slot. Loading a profile through the game's ini config with any other GameCube Controller port of even the Wii Remote does not have this issue. Neither are there any issues with settings lines such as "PadType0" and "WiimoteSource0". As soon "PadProfile1" is used in the game's ini config the hotkeys are being prevented from using. A quick way to solve the issue with the hotkeys is to comment away the line using "//PadProfile1" for example. I tend to use PadProfile1 = XInput0-XY for example in a few games where I switch out the X and Y button with each other, where XInput0-XY is the name of the profile that does so. Should I remake the issue on the bug tracker? I don't I have the right to edit an issue on the bug tracker? However, I think I may have isolated the problem. 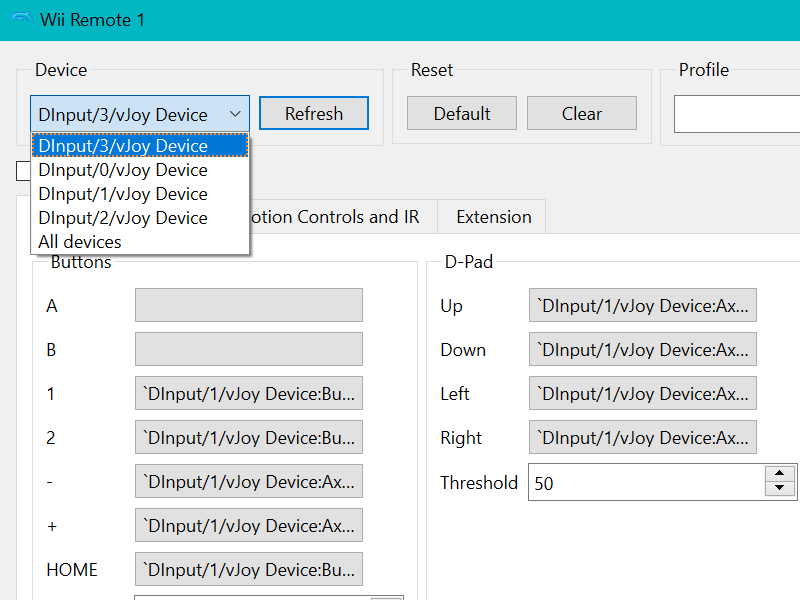 For some reason, the dropdown for picking input doesn't show anything for keyboard, only these strange "DInput/0/vJoy Device" things. So far, this is what it looks like. No option for selecting keyboard or mouse input, which is strange, considering both my keyboard and mouse (trackpad) are physically attached to the laptop. And other emulators recognize all other inputs just fine. I've uninstalled and reinstalled Dolphin, wiped it, and it won't recognize it at all.